Bowling Green, Kentucky is only now starting to get into the moveable feast business, with most local trucks only gearing up this year, but trends indicate the city is primed for growth. However, accoriding to BG Independent News, Bowling Green’s mobile food vending ordinance is not exactly a recipe for success for food trucks. 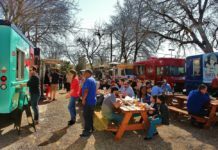 The ordinance limits hours of operation to 10 a.m. to 5 p.m., and restricts food trucks to 150 feet from the throughway. The rules are “not very conducive to opening a food truck in this town,” says Mac Henry would like to open a food truck business in Bowling Green and that food trucks are currently “a big part of the culinary innovation” going on in the nation. City Council president Mike Aspacher said council is the body that would have to make any changes to the ordinance. He added that modifications would only be made after the ramifications are studied.